Yukon Dentist - Jason Dukes, D.D.S. The Office, Where You Can Feel At Home! 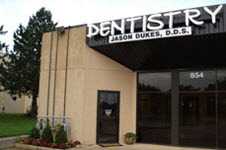 When you visit Yukon, OK dentist Dr. Jason Dukes, your smile is our top priority. Our entire team is dedicated to providing you with the personalized, quality dental care that you deserve. At Jason Dukes D.D.S., you are not just another set of x-rays or another second bicuspid that needs filling. Jason, along with our entire team, realizes that you are an individual with unique needs and concerns. It is our mission to discover those needs and fulfill them. We do this by listening - really listening. We want to know what you think about dental care and the general health of your teeth. We will find out how you feel about your smile as it is now, and as you would like it to be. At Jason Dukes D.D.S., we will ask about everything from your first dental visit to your last, and especially about what you want and don't want. Call (405) 354-4422 to Request Appointment! Part of our commitment to serving our patients includes providing information that helps them to make more informed decisions about their oral health needs. If you are the kind of patient who wants to know what is going on during treatment, our skilled dentist and our staff will be sure to provide a step-by-step explanation while you are in the chair. On the other hand, if you would rather just relax during treatment, we will set you up to watch a hit movie from our DVD library (there is a screen in every treatment room), and give you an update when the procedure is over. And if you have any fears or concerns about dental work, the entire staff at Jason Dukes D.D.S. will help you put them behind you. Yukon dentist, Dr. Jason Dukes is dedicated to general, family, and cosmetic dentistry with services including dental exams, dental makeovers, teeth whitening, veneers, crowns, x-rays, cleanings, and more. Please call our dentist in Yukon, OK to schedule your next appointment.